A long time client, Stoddards.com started with a small WordPress eCommerce site and grew into a large Magento site which includes an integrated Ebay store as well. When a change of business partners necessitated a new name, we saw that as a marketing opportunity, rather than a problem. We launched a full-scale rebranding project, changing “Stoddards.com” into “The Proper Moose”, a New England-based online store featuring ‘Carefully Curated Products for Discerning Ladies and Gentlemen’. The rebranding allowed us to research the marketability of the site’s products, and then to configure visual design, content, site structure, and social media around that newly-defined, carefully determined customer. 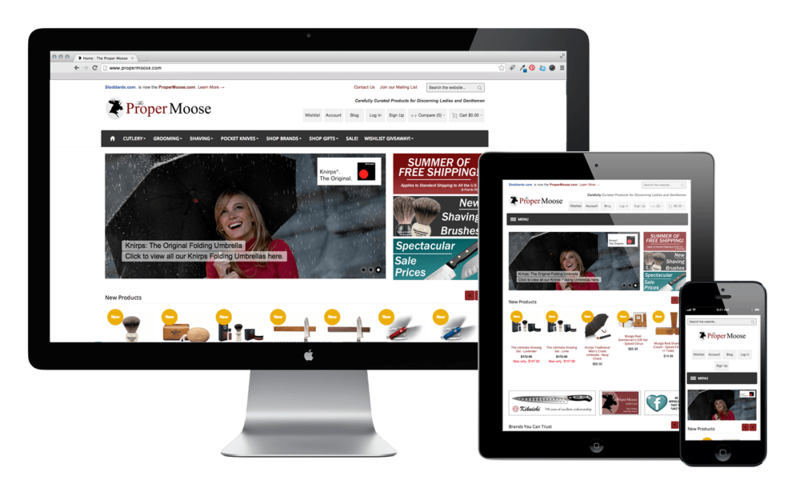 Services for The Proper Moose include web design, web development, SEO, ongoing technology development, Ebay store management, print design, email marketing, loyalty programs and social media marketing.